Where you're living: It's a range: your cousin's couch, Mission Beach, or someplace that makes no sense at all, like Mission Valley, because you didn't know any better. Where you're going out: Mostly beach bars full of tourists. Who are still wearing their bathing suits. Even though it's midnight. And November. Your mantra: "Heaven... 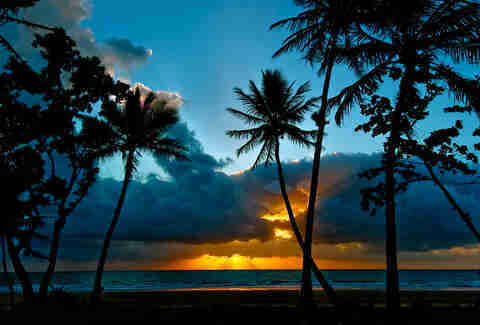 I'm in heaven... "
Go-to activity: Instagramming photos of palm trees, eating In-N-Out, smiling. Where you're going out: Miller's Field. 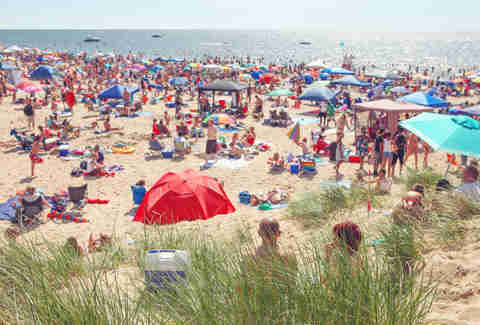 PB Shore Club. If you're incredibly sophisticated, PB Ale House. 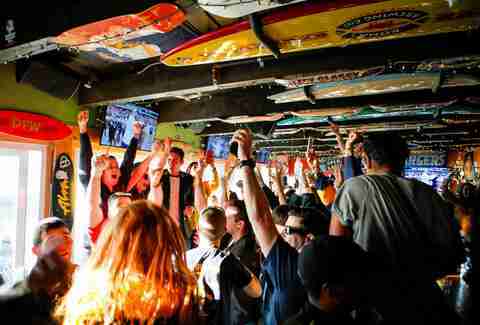 Your mantra: "California knows how to party." Go-to activity: $1 oyster night, avoiding your Craigslist roommate, drinking, skateboarding, and surfing (although probably not all that well). Living in PB is like how getting the chickenpox was back in the day: not everyone gets them, but most people do. And since most people live in PB at some point, most people have their PB firsts. Their first Red Bull vodka slushie. Their first Slomo sighting (that guy is winning at life, by the way). The first time they learn that drivers in PB are vicious because a car almost hit them on their beach cruiser. PB is a mixed bag. It's college kids, tourists, and surf rats, and then it's families doing remodels on their two-million dollar homes. 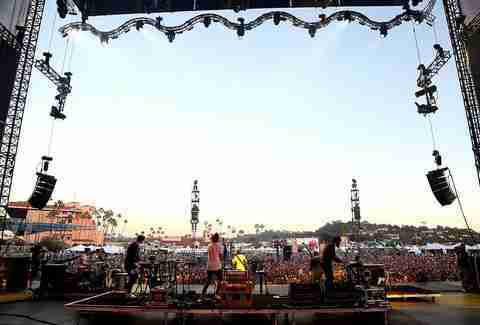 This stage, though, is "I'm young, pretty broke, brand new to San Diego, and destined to make questionable decisions," and though it's not the classiest stage in your evolution of becoming a real San Diegan, it is a fun, and dare we say necessary, one. Where you're living: PB, OB, or North Park. Where you're going out: You're not. You need a break. Your mantra: "I will adjust, I will adjust, I will adjust... "
Go-to activity: Saying I-5 and I-8 instead of the 5 and the 8, getting stung by stingrays because you don't know to shuffle your feetsies, crying yourself to sleep. At six months in, there's still a lot you don't know, and this can be challenging. "That dude had so much speed on that last gurgler, but all he did was ramp out" sounds like gibberish, but you know, with a sinking feeling, that it's a real sentence. You don't know which is your favorite hot sauce between Cholula and Tapatío, and this is a HUGE deal, but you don't yet understand why. In some ways, you have become more like a local, e.g., your parallel parking skills have improved, and you were miffed when you couldn't find a decent açaí bowl at the Newark airport. But you're still a newbie. A kook. Essentially, a foreigner. But don't worry, brah. Your kookhood (Kookdom? Kookage? Kookiness?) won't last forever. 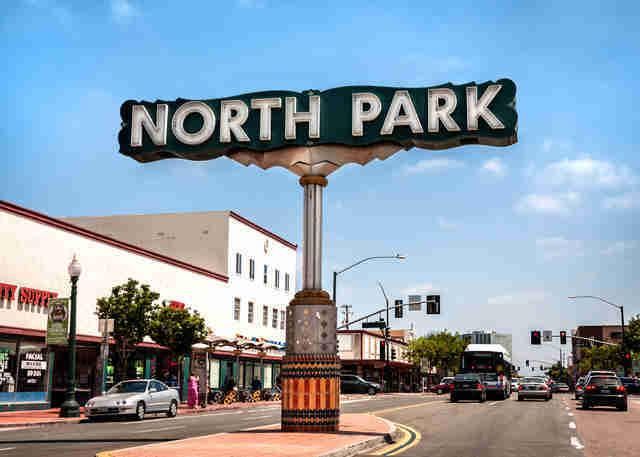 Where you're living: North Park, Normal Heights, OB, or Encinitas. Where you're going out: Seven Grand, Park & Rec, Winstons, Sycamore Den, Union, sweet, sweet breweries. Basically wherever your hipster friends/kickball team wants to go. Your mantra: "Dude, I'm down." Go-to activity: Going to beer/food/music festivals, making friends, exploring the city. Like a caterpillar transforming into a tanner, less punctual butterfly, you are turning into a local. You have said adios to your boat shoes, North Faces, and Lacoste polos, and hola to ironic Hawaiian shirts, Rainbows, and Vans. At this stage, one year gone, you're more settled. And sure. Maybe you're not the best surfer, e.g., you paddled out at Windansea yesterday on a Wavestorm and were almost murdered by a sea of aggro 14-year-olds with acne and sponsors to boot. But at least you're putting yourself out there. And at this stage, that's basically your motto. 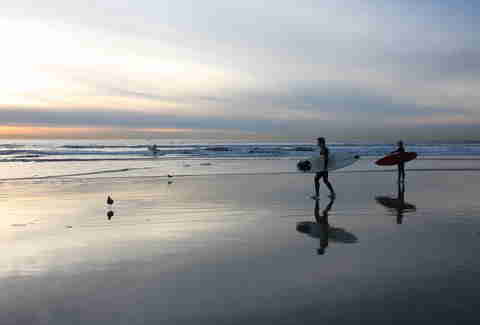 You are realizing that San Diego is like a sandy, saltwater-rich onion: it has a lot of layers. And you intend to slice it and start crying make the most of it. Where you're going out: Whatever cool spot that just opened up. A smattering of breweries. Your mantra: "Zonies go home." Go-to activity: Outdoor activities (hiking, golf, laying on the beach doing nothing); making trips to places like Palm Springs, Mammoth, Oaxaca, and Tahoe; enjoying our beautiful weather. Where you're living: Doesn't matter because in a month, you'll be living in Denver, Chicago, or San Francisco. Where you're going out: You're not. You're pinching pennies. Moving is expensive. Your mantra: "Get your s*&$ together, San Diego." Go-to activity: Taking online apartment tours, packing, surfing while weeping a little. You’re going to miss it. Enough is enough. If you see one more "PB SD" tattoo... If you have to sit on the 805 in mind-numbing traffic one more time... If you see one more person barefoot in a restaurant… You're going to end up with your arms wrapped around your knees rocking to and fro in a corner somewhere, drooling and eating a bar of Sticky Bumps. Where you're living: The places mentioned in Stages Three through Five. Or, a house you bought in Clairemont, Oceanside, or a suburb off the 15. Where you're going out: The best spots. Plus, better-than-average beach bars (because this will just be a constant in your life). Your mantra: "For better or for worse, in sickness and in health... "
Go-to activity: Becoming a grownup, promising yourself that this will be the year that you finally master surfing, pronouncing the Spanish street names correctly, feeling pride when you hear a Blink-182 or Slightly Stoopid song. Congratulations, brah! If you have made it to this stage, you are officially a true San Diegan. Closing in on a decade here, you know that while San Diego is not a perfect city -- hell, you were about to leave -- it is a special one. 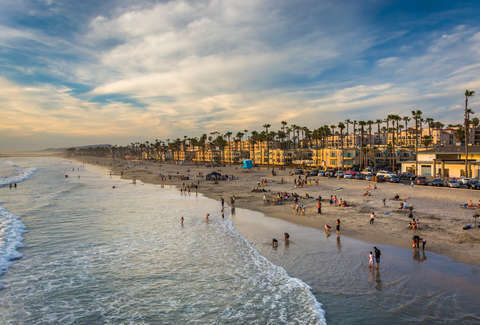 From its beer and food scenes, to its art, to its gorgeous beaches, SD has so much to offer, and frankly, just seems to be getting better and better. 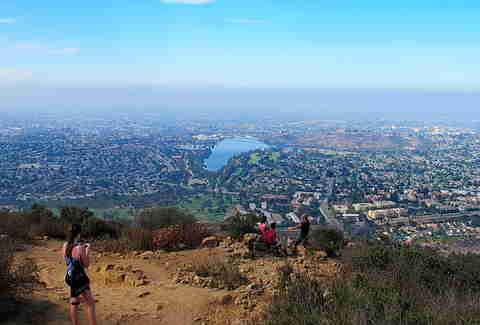 San Diego is your home now, and like, dude... there's like, nowhere else you'd, like, rather be. Natalie Holtz is a writer from San Diego who’s, like, dude, been through all of these stages at least twice. For more of her writing, check out her blog: www.thesurferstokeproject.com.